Over the past weeks, Palmer Report has been reporting on the mysterious round-the-world gallivanting of Russian billionaire Dmitry Rybolovlev, who spends most of his time at his home in Monaco but has a habit of flying into whatever city Donald Trump happens to be visiting at the time. And thanks to an exposed multibillion dollar money laundering scheme on the part of a bank that’s closely tied financially to both Rybolovlev and Trump, we think we know why. As we’ve been documenting this month, whenever Donald Trump has left the White House and ventured anywhere, Dmitry Rybolovlev (aka the “Russian King of Fertilizer”) has tended to show up in the same city. It happened during Trump’s victory tour in Concord, North Carolina, a place Rybolovlev had no legitimate reason to be. It happened again when Trump vacationed in West Palm Beach, even though that required Rybolovlev to fly all the way in from Switzerland. That was also the time that Trump deposited reporters in a semi-submerged basement of his resort with black plastic covering the the windows. That only leaves two possibilities. One is that Trump and Rybolovlev just happen to have a remarkably coincidental travel schedule, and that while Rybolovlev was in West Palm Beach, Trump went out of his way to make sure the press couldn’t see what was going on at his resort for no real reason. The other is that Trump and Rybolovlev have been meeting up whenever Trump ventures away from the White House. 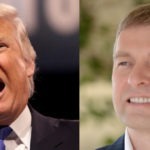 The latter possibility has long been bolstered by the fact that Trump sold Rybolovlev a mansion a few years ago that neither of them lived in nor cared about, suggesting the sale was mere cover for shifting money from Russia to Trump. And that theory just got bolstered significantly, thanks to a new breakthrough. Earlier this month we brought you the story of Deutsche Bank in Germany getting busted for laundering more than ten billion dollars out of Russia and into places like New York. This stood out because Deutsche has also loaned more than a billion dollars to Donald Trump, who just happens to be based out of New York, even at a time when the bank was struggling and Trump was viewed as a poor loan risk by every other bank out there. It turns out Deutsche was funneling that money through Bank of Cyprus. Guess who owned a 9.9% share in Bank of Cyprus until 2013? Dmitry Rybolovlev. So we can now draw a direct line of more than a billion dollars flowing from Russia, through Rybolovlev, to Donald Trump.